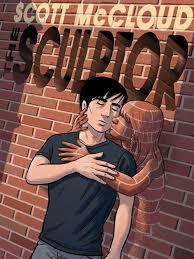 THE SCULPTOR’s First Starred Review! Humbled artist David Smith makes a deal with death in order to achieve immortality through his art. Granted the power to create extraordinary, impossible sculptures in exchange for giving up his life in 200 days, Smith inconveniently finds himself falling in love. It’s a simple but elegant Twilight Zone-ish twist, but McCloud uses it as a springboard for a psychologically complex character and an exhilarating exploration of big ideas about art, love, and life. Author of the indispensable Understanding Comics (1993), McCloud’s grasp of the craft is astonishing and complex. He offers exquisite silent passages and modulated panel sizes that guide the reader’s emotional journey through powerful shifts and deepen David’s compelling character, all while employing a straightforward art style masquerading as simple cartooning shorthand. His brilliant pacing and unobtrusive manipulation of the space between panels create intimate, intense moments, and it’s never more captivating than in a staggering sequence of 14 single-panel moments that encompasses the suffering of David’s 26 years, continually hounded by loss. The fluidity of McCloud’s visual narrative carries us along with a sweep impossible to duplicate in prose, and, through to its climax, the story’s commitment to its harsh, inevitable, but ultimately sublime outcome qualifies this as a work of stunning, timeless graphic literature. Next Post HEAR THE WIND BLOW, DEAR Is Now Available Again!